The three main steps for living an adventurous work + travel lifestyle may be simple but are often overlooked in the cloud of overwhelm. Everyone says they want to travel, but it seems too big a task when there are so many factors involved. The key is to not get caught up with all the little details at the beginning. You can't get on an international flight without a passport. Just like you can't start your work + travel lifestyle if you don't know what type of travel you're doing. First we started with the Dreams > Goals > Reality system. We also covered the three main types of travel jobs, how to stay organized when searching for travel jobs, and how to travel long-term and not go broke. Now we're going to focus on the top three main steps of going from zero to ADVENTURE! Here are the "bare bones" - the three essential steps - on how to plan travel and your work + travel lifestyle! 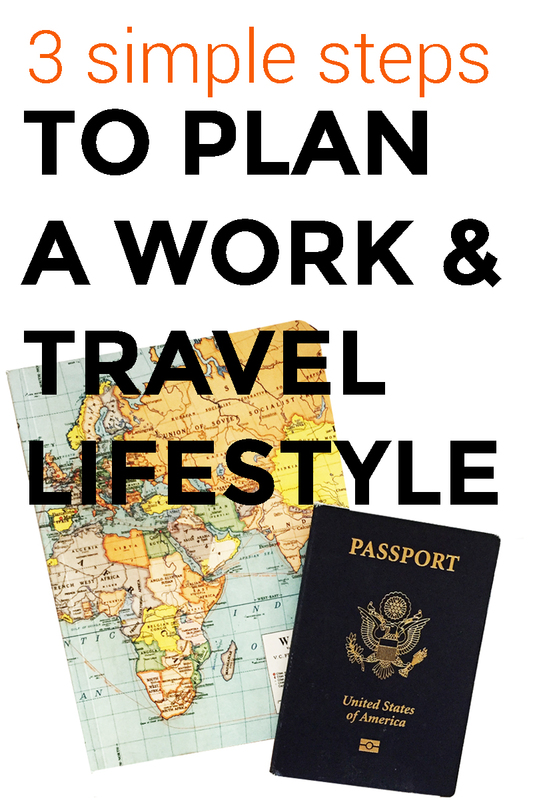 What is it exactly that you want to do to live a work + travel lifestyle? You'll need to narrow your search down to 1-2 types of work + travel opportunities. Once you've focused in on 1-2, everything else you consider (where to go, when to go) will be based on the type of work + travel opportunity you're working toward. Don't know what types of travel jobs - or "non-travel" jobs that allow you travel - are out there? For starters check out this post on 11 ways to make money while you travel. You could start by researching "Tips for Moving to [insert destination here]," but to get more focused you'll want to also look into advice for specific work + travel opportunities. Think "Best cruise ship companies to work for," or "Tips for becoming a digital nomad who travels." Where do you want to go most? It's actually a more difficult question than it seems, because there are so many cool places around the globe. Do you have to pay for flights? Start with Kayak's Explore tool to find the lowest airfare around the world. With that tool you can put in your departure airport as well as time of year you're planning on flying to see more exact prices. If you're deciding between a couple destinations, one that has drastically reduced airfare in comparison could help you make your decision, if the cost of airfare is a factor. Do you know which continent or region you want to go to? Do online research specific to that country. For example, if you've decided you want to teach English abroad, and are thinking Southeast Asia, search "Teaching English in Thailand" or "Tips for Teaching English in Vietnam" to get more targeted results. You more likely to find super niche websites that give you really good information on exactly what you want to do. However, when you decide when you're going to go, it becomes much more real. You now have a date on the calendar that gets closer with every passing day. Exciting! First, figure out when a good time would be by considering any plans you have in the near future. Are any family members or close friends getting married, and you're going to their wedding? You'll need to make sure you're home for that or are able to come home as to not miss it. If you're in school, consider breaks off or traveling after graduation. Getting a travel job after college is one of the smartest decisions I've made to date. This week we've been taking one step toward our #TravelGoals on Periscope and Twitter. Thanks to all of you who have joined so far! How are you doing on your #TravelGoals challenge? Let me know in the comments below! Newer Post#TravelGoals Series: Challenge Recap!